Great to have just as a soup or with rice, coriander-jeera rasam is simple to prepare and very tasty ! 1 tsp Ghee/Clarified butter or vegetable oil can be used. 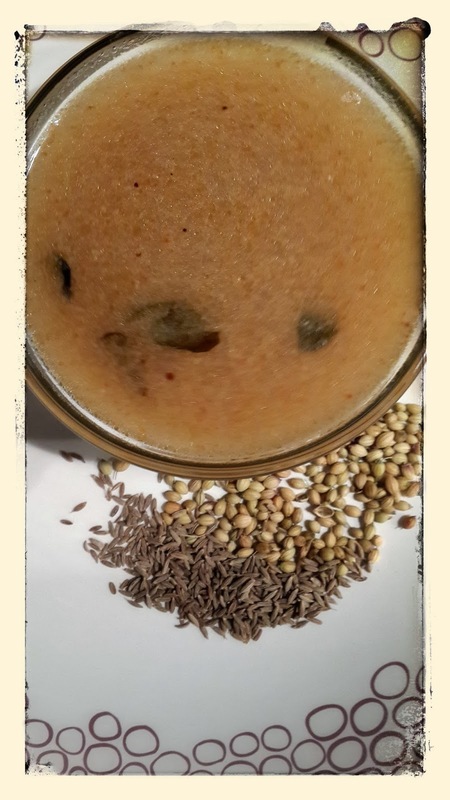 Grind together coconut, coriander seeds, jeera, cilantro and red chillies with a cup of water. Take a container.Add about 2-3 cups of water and dilute the ground mixture. Bring to boil on stove. Add tamarind paste, jaggery and boil for another 4-5 mins. Now tadka with mustard seeds, hing and curry leaves. Serve hot with rice and enjoy!